D.E.M. 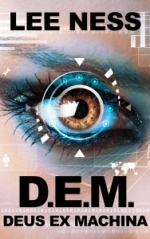 – Deus Ex Machina is Lee Ness‘s contemporary thriller on computer hacking and its consequences, both intentional as unintentional. Rachel by impulse reacts to a mysterious email in a desire to justify a recent aduction. Buying a top notch door for her appartment, she forgets basic warnings. Key holders are the weakest links in physical entrance solutions. The same applies for her new Vortex computer. Smart guy and helping hand Cam, and Deb, her so-called innocent neighbour are part of a complot that intrigues Rachel further and further. Emails containing hacking assignments, larger rewards. What starts small ends up in breaking in defense systems providers, impacting allied nations. Geek boy Cam’s out for more than computer help, but the flirting offsets Rachel for a long time. It’s humorous for the reader to see this play alongside the hacking story line. Several twists keep the pace at high level, building up to a kind of perfect crime completely getting out of hand. You wonder what Ness invents as near escape and happy end. The author really keeps you engaged until the very last page, thanks to the unpredictable course of events. Nothing proves what it seemed to be. Thee main 4 characters are developed and change relationships throughout the book. Great work. Lee Ness writes both fiction and non-fiction books and non-fiction articles. He has a historical fiction series set around the Olympics in Ancient Greece circa 440BC and a technological thriller called D.E.M. – Deus Ex Machina. His first book The Sports Motivation Master Plan passes on the experience of many years coaching athletes in multiple sports. Lee’s articles appear in Athletics Weekly, on speedendurance.com and on stack.com. Lee is head coach at City of Salisbury Athletics and Running Club and was Wiltshire Sport Coach of the Year in 2014. Do you really have to work 8 hours a day?